Ah, January -- back to reality. I hope you all had a lovely holiday. Before we get back into the regular swing of things, I wanted to share some snaps of our winter break. We hit the road heading south in search of sunshine and swanky retro fabulousness, and for the most part, that's what we got. So this is the house we rented in Palm Springs. I meant to take a few snaps inside, but then forgot. Dwell on Design did a video tour of the place a few years ago (click on "Wexler Harrison House"). The furnishings are all different now, but you'll get the idea. This house is really all about the backyard, anyway. 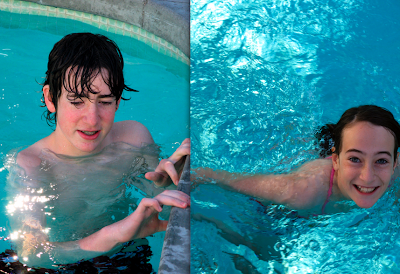 I think I took these pictures of the kids frolicking in the pool on Christmas Eve. It's just wrong, I know. Elvis and Priscilla spent their wedding night here. 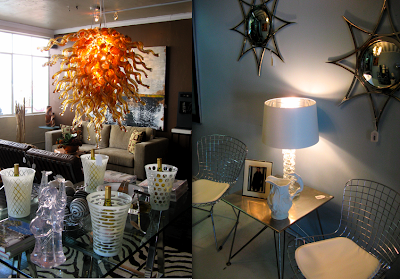 Trina Turk Residential was fun in an over-the-top, Palm Beach kind of way. (I was too shy to snap pics there; the ones above were borrowed from The Contemporist.) And there was the 111 Antique Mall, a great jumble of a secondhand store in a random strip mall north of downtown. (Thanks to the always-chic Maison 21 for the tip on that one!) I lusted after a pristine and decently priced set of teak dining chairs and a bunch of midcentury pottery there, but didn't get a chance to return for them after my initial hurried run through the shop. Just as well, because we're totally broke. All told, though, I have to say that I wasn't too impressed with the shopping in Palm Springs. The other stores I visited were mostly obscenely overpriced midcentury boutiques (trust me -- you can do way better on eBay and craigslist) or equally overpriced trend emporiums that looked like a Z Gallerie exploded inside. Asylum, pictured above, was probably the least offensive of them. Elsewhere, I saw a lot of things that I'm positive the shop owners picked up at Pier 1, the Z, and even IKEA and tripled the price on before putting them out on their floors. Besides shopping and driving around random neighborhoods, my favorite thing to do on vacation is hang out at hotels we can't actually afford to stay in. 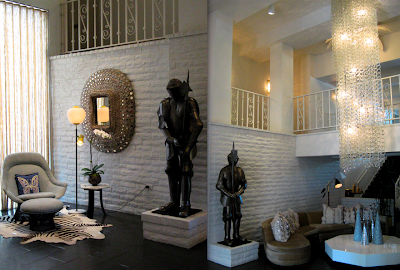 And, of course, you simply can't go to Palm Springs without checking out the Jonathan Adler-designed Parker. I'm finding myself less and less of a fan of Adler's pottery and product design (most of which seems to be shamelessly ripped off from original midcentury pieces). 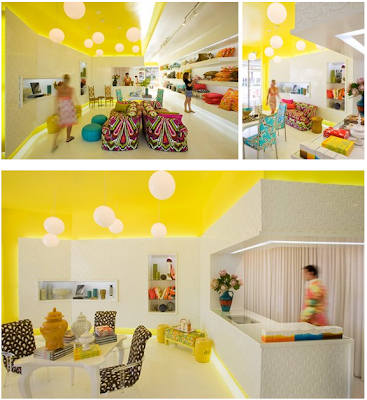 But I still love his interiors, which have a great sense of exuberance, wit, and fun. The Parker's lounge almost makes me miss my parents' circa-1974 living room. Almost. Plus, the grounds are gorgeous. Brunch on the patio at Norma's. There were a lot of hungover, sunglasses-sporting Hollywood hipster types sucking down Bloody Marys when we visited. The gift shop is a bit Legally Blonde, no? Here's Nick hamming it up at Mister Parker's. If you're in the area and want to drink old-school cocktails and spend $400 on dinner (thanks, Mom! ), this is the place for you. We also stopped by Kelly Wearstler's Viceroy Hotel, which was super-glam and swanky. I'm pretty sure this is the yellow-and-white tile wall featured on the cover of Modern Glamour. Can't you just picture Kelly striking a pose here in some insane couture ball gown? One of the cleaning ladies saw us wandering around drooling, took pity on us, and invited us to poke our heads inside a Viceroy suite. Sweet! One of the property's three pools. If I ever win the lottery, I'm moving here. The recently refurbished Riviera Resort is more Vegas than Palm Springs, but is definitely worth a gander. These portraits of local legends (this one is Bob Hope, of course) were made entirely of sparkly bits of metal. Sadly, the shot I took of the pre-surgery Cher in all her glory didn't turn out. My 13-year-old says he want to be a cabana boy here when he grows up. That's right -- aim high, my love. In a future life, I think I'll need an enormous, patent-leather wing chair. Something about this place makes me want to drink whiskey and eat steak. OK, on to L.A.: I would love to tell you that we did fabulously cool things there -- but the fact is, we mostly drove around kind of aimlessly, tried to visit a bunch of stores that were closed for the holidays (of the ones we managed to get in, ReForm School was my favorite), did some dorky touristy stuff the kids begged to do, and sat around at my sister- and brother-in-law's little Silverlake bungalow, noshing on vegan treats and watching DVR'ed episodes of Whatever, Martha. (I'm now completely addicted -- and think I may be even more terrified of Alexis Stewart than I am of her mother. Thanks, guys!) It was lovely, if not terribly exciting. Dinner at the Farmer's Market with Nick's beautiful sister and her hilarious husband. 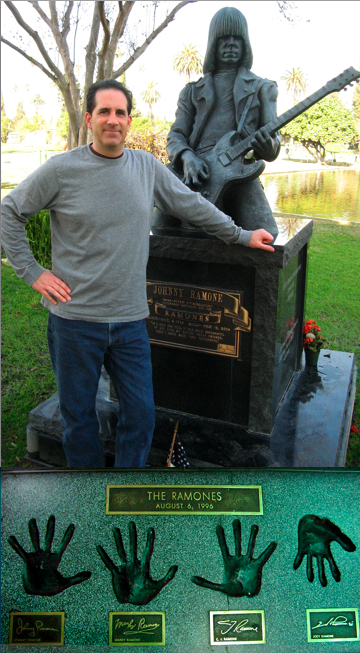 My husband makes a pilgrimage to the Hollywood Forever Cemetery and Sunset Strip Guitar Center. The weather was insane -- mid 70s and sunshine the whole time we were there. All in all, it was great fun -- although we're going to be eating rice, beans, and Top Ramen and Netflixing it on date night for months while our wallets recover. A great post about your trip! Thank you for all the details about palm Springs because though we've been living in So. Cal for a year now and have ventured to Joshua Tree, we haven't made it to Palm Springs. I think we will go, but from the sounds of it we should try to stop at yard sales on the way there rather than look for our coveted midcentury modern furniture in the stores there. By the way, I've spent some serious time on your site and your flickr collection of pics from your house and I would just love to know your ebay secret! Can you share your search terms? I go there and give up after five minutes. A hearty THANK YOU in advance! Thank you for all of the wonderful photos. The captions make me feel like I was there! glad you made it to the 11 mall- pretty good shopping, no? and glad you enjoyed you're trip- while i'm not getting out quite as frequently as i used too, i find my desert trips neccessary to my well-being! What gorgeous photos!! Makes me want to go to socal again. That was a super fantastic tour! Love the pics, love your commentary, and your family is adorable. 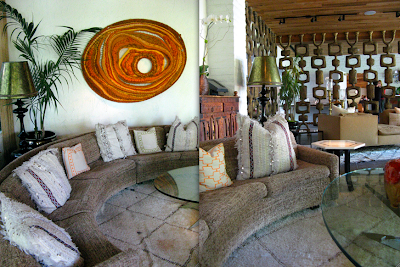 And hey, Maison 21, I am DYING to go on the thrift tour of Palm Springs! Junk, dirt and crap, are but minor obstacles in my quest for cheap treasures. I wish I could afford to move back to California. It's freezing, literally, where I live. 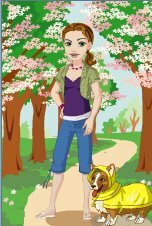 Hi Tamara -- A few of my eBay secrets are here. And M21 -- You are ON! That sounds fantastic. Next time I go to palms Springs, which is all the time, I'm taking this post with me. Your Palms Spring is far sexier than mine. Yay. The photos remind me of my recent trip there. I have to say, I was shocked at the great service at the Viceroy. Low-key, quiet, but always somehow RIGHT there when you needed just one more drink, poolside. Great photos. i am going to The Parker next time. It looks great. Love the blog, but please -- how do I turn the music off?? It's 2:20 a.m.; I nearly woke up everyone in the house!! Not cool. Sorry about that, Anon. Hit "pause" on the embedded video to stop it -- I couldn't figure out how to post the video without it starting automatically, accompanied by the cheesy electronic music. I was at all the same places as you. You're right, the prices were way out of whack! By the way, TT Residential is not KWID. Trina herself was in the store when I stopped by -- she's super nice. She said a local designer did the residential store. Thanks for the correction on TTR. you are beyond fabulous. these photos and your stories are amazing. i used to live around the corner from the naked statues of david. 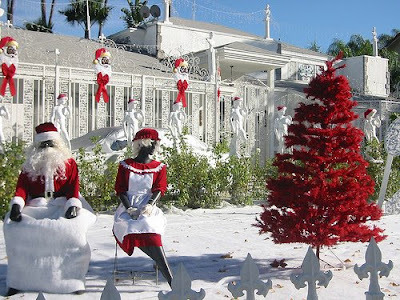 i wanted to take a picture of their xmas set up this year, but didn't get around to it. thanks for posting your amazing holiday pix!!! great re-cap. You MADE It to J-tree (dude) see? it's pretty. I didn't know about the Riveria, good to know. I totally agree with you about the shopping. It's like the shop owners went on ebay, thrifting etc and then set up shop with ridiculous price tags. dumb. Did you not at all see the 'trading spaces' element at the Viceroy? A few years ago, I stayed in a regular room (not a suite) and I accidently pulled off the plastic, wall medallion. I was trying to see how it was mounted. velcro. and then one of the mirrors on our closet door came off of its double stick tape. It sort of lost some of its glam. Totally agree about the PS boutique stores. Plus, I've found the employees to be very snarky to us, since we don't have the requisite hipster look. Good to know that the Riviera is finally re-opened. We've stayed there years before and loved the very private balconies w/ great views of the mountains. Hope I can still afford it! P.S. I live a bit more than an hour from P.S., and we had heavy rain and COLD temps on Christmas. You guys lucked out! We are here now. Thanks so much for pointing me here Leah. We are staying in the Andreas (central, retro, awesome staff, lovely pool). This morning, thanks to you, I think we are going to try Norma's for breakfast and then check out TT Residential! Yay!